It doesn’t take much, just a little know-how and someone with attention to detail to keep these things updated on your page as you add valuable content to it. 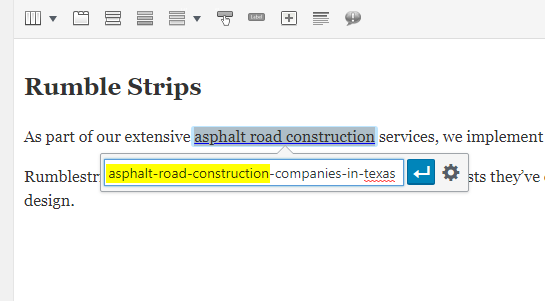 You’re an asphalt paving company in Texas updating your optimized website with new content, blog posts and projects. Got it? Great. Let’s get started. Whatever page you’re updating or adding text to on your website, you’ll want to make sure the keywords you’ve chosen to optimize on the page are incorporated naturally into your H1 headings, AKA the page title, wherever possible (but don’t overdo it! That’s called keyword stuffing, and Google really doesn’t like it). Adding images to an optimized web page is a bit more straightforward than text. Once you add the image to your page or post, you’ll want to edit it so you can update both the alt and title tags to include the keywords selected for optimization on that page. You’re free to just use the keywords as your alt and title tags if you’re not a wordsmith, or if you’re just feeling lazy… Though, some say it’s good practice to be really descriptive with the alt tags because these are what appears for broken images and visually-impaired visitors using screen readers. Either way, it’s best practice to put SOMETHING here that includes the optimized keywords for that specific page. Say you’ve launched a new service and you’re adding a whole new page to your site. You’ve probably already had your marketer perform the research (and if you don’t have one, we know one 😉) and choose an appropriate keyword or phrase for optimization. If you plan on doing the research yourself, here are a few tool suggestions… we use Google keyword planner. So when you go in to create the new page, you’ll need to not only perform each of these steps for all of your content, but you’ll also want to update the page’s URL (or permalink) to reflect the terms you’re optimizing for on that page. Let’s say you started a new service line for parking lot construction. While you may internally refer to the service as “parking lot repair,” that’s not necessarily what people will search for to find your services. So therefore, that’s not what you’re going to name your new page. You’ll want to name your page for the keywords you’re optimizing for. Note in this example that all of the words you want to link are present in the URL permalink for the page you’re linking to. This is ideal. This one’s a bit of a special circumstance, so I’m going to break it down for you. Think of optimizing a blog post the way you would a one-page website. You’ll pick your blog post topic, write the post, and do the research on search terms related to your topic and choose words for optimization. Title your post to include your keywords. You’ll find more pleasurable SEO results when you title your posts clearly so people will know exactly what your post is about, meaning the title should answer a common question people are asking in relation to your industry. Snap, Crackle, Pop… Crappy asphalt has gotta stop! It’s fun, it’s catchy. But what the heck does it mean? What is an article with this title actually about? 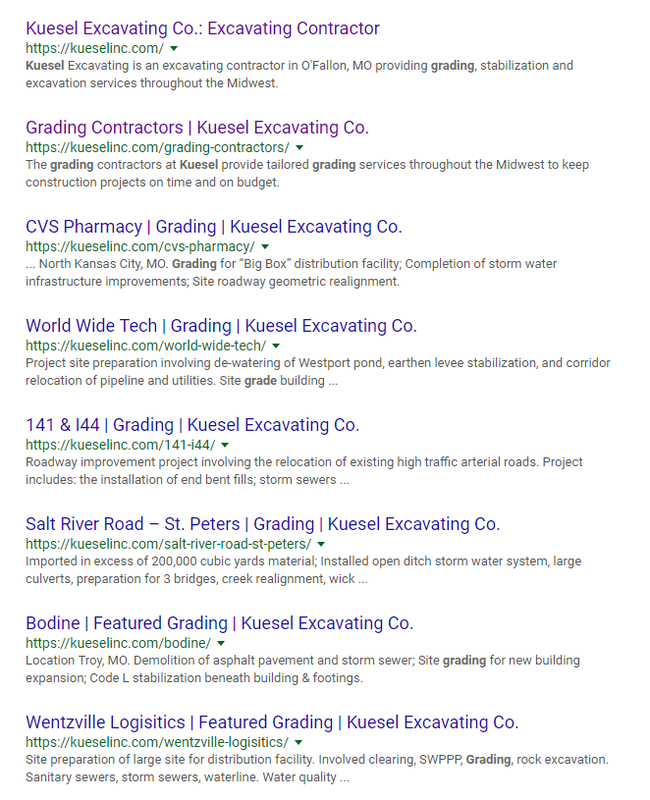 If you can’t tell from the title, it’s not good SEO for your construction website (note the linked words and where they link to ). Question/Answer Style: When is it time to repave my asphalt parking lot? Know with these 5 signs. The power of words is strong with SEO. Master it wisely. Use your keywords naturally in your post headings and text at least twice within each. Use your keywords in your alt & image tags. Make sure your permalink includes all of your keywords. When adding blog posts, your title is used to automatically generate your post’s URL or permalink. In the above examples, you wouldn’t really need to do anything with the permalink since all of your major keywords are in the blog post title. But you could, if you wanted to shorten your URL just use the keywords and leave out the “your, it’s, to” etc. 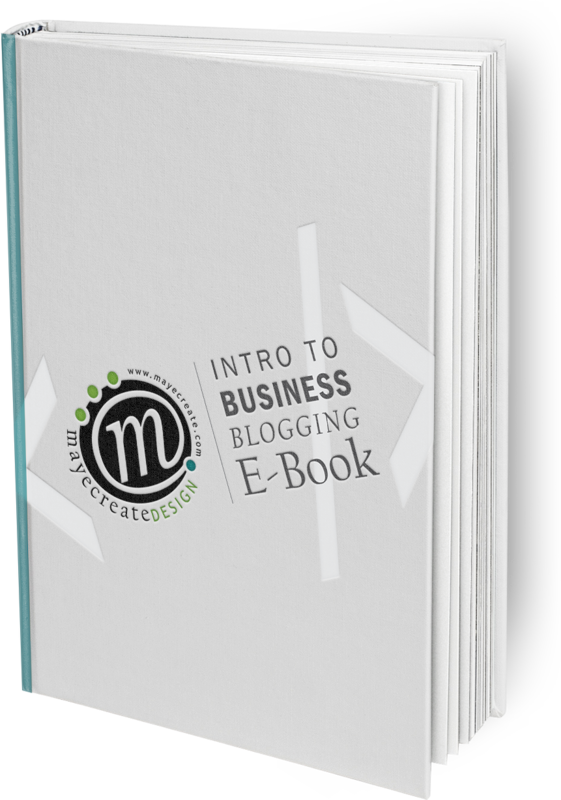 Link throughout your blog post to other blog posts and pages on your site wherever possible. The biggest thing to remember with SEO when adding projects to your projects section is to highlight what you did for your client. Let’s say you just added a project to your website called “Lakeway Center.” What does that tell your website visitors? Darn near nothin’. Unless it’s an uber famous building or property, no one’s going to care about the official project name. So, when naming your projects, include the service(s) you provided for your client in the title of the project. If location is an important deciding factor for your prospects, you can include that as well. The idea is to consider what people seeking out your services are searching for online and combine that concept with the value each post in your projects section holds on your website. Each project page acts as an entrance to your website; thus, by including your services in the project post name, you’re helping your prospects find a way into your site by giving Google the clues it needs to serve your page. Those top two listings are Kuesel’s home page and their Grading service page. Count all of the other listings Kuesel would have missed out on if they hadn’t included the word “Grading” in their project titles. That’s a lot of potentially missed opportunities if you’re not following the same practice. The name of your project isn’t all that’s important for maintaining quality SEO for your website. Include an on-page project description with at least 500 words sharing the problem your client had and how you provided your services to solve it for them. It might seem unnecessary to you, but pages with no words don’t optimize well, so you need ‘em in there. Link the services you provided on the projects to their respective service pages on your site. (Try to use the same names you’ve used for your services pages when writing your descriptions – like we did above). I like to think of these two points as a way of swinging your website like a hammer…in other words, enabling it to work for your business. It’s a wonderful tool, your website (if it was built well, of course), and you want to keep your visitors on it as long as possible, right? So show them what you’ve got by moving them through it naturally with helpful and well-placed links to the information they want. Now get out there and get your SEO on! 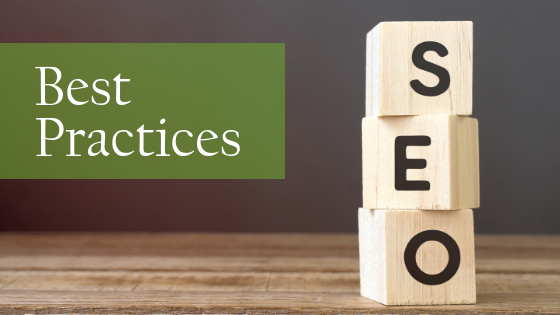 Following the above practices (alongside an optimized Google My Business listing) is sure to keep your SEO ranking in good standing — as long as you’re mindful of how you do it. Consistency in completing these steps as you update your website, and frequently adding new content to it, will help your website following grow in ways you never dreamed possible.